Earlier this month, C-ville news put out the story found in the link below. The short and sweet version is that students were spotted swimming after/before hours in the AFC pool. They entered through the tunnels, and escaped back through them before police could arrest them. Three things caught my attention from this news report, and I would like to offer an opinion on each of them. 1) How surprised the news anchors were that buildings such as the AFC could be accessed by steam tunnels and that students would have the audacity to use them. They acted thoroughly shocked, which is strange considering how commonplace the practice of steam tunneling has been for decades. 2) The reason the police gave for the situation being "no laughing matter": swimming without a lifeguard. When this reason was given--and other reasons such as the dangers of steam tunneling were not--the police report suddenly became the true laughing matter (in my personal opinion). Setting aside other issues, how horribly dangerous is swimming? Driving a car has got to be at least 1000 times more dangerous than swimming (when one knows how to swim), and everyday millions of people drive wherever they please. A lifeguard is helpful, but the public authorities should not get shivers down their spine at the mere thought that a swimmer might actually swim without someone in a red swimsuit sitting high above them in a chair like Abe Lincoln. Perhaps we should have lifeguards for tree climbing, skateboarding, hopscotch, and tricycle riding too? The lifeguard thing was likely a cover for the real pet peeve--bad publicity for the university (or parents complaining about security). Sadly, the more publicity things like this get, the harder faculty and security work to shut down avenues of exploration. I understand why they would do so, but those who enjoy innocent exploration and the opportunity for unique photography may find it unfortunate. 3) All explorers understand that there is some possibility for arrest on the grounds of trespassing if they are foolish enough to make their presence noticeable. (Although it's worth noting the law's requirement for a posted sign.) However, the news report also mentioned that students could face possible "expulsion." In my opinion, this is ridiculous. 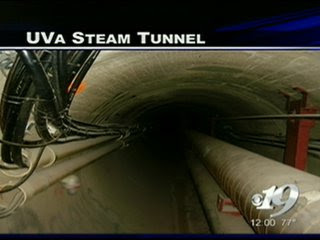 It is even more ridiculous at UVA where there is a well-established tradition of urban exploring (or at least steam tunneling). When there is no intent to vandalize or burglarize, I consider "expulsion" to be an incredibly gross and outrageously inappropriate consequence. Innocent exploration at night is essentially the same things as taking a hike across the Blue Ridge mountains on a sunny autumn day. Humans are naturally curious creatures and have an inborn attraction to beauty and adventure wherever they may find it, some more than others. Yes, there are certainly some dangers, just like there are dangerous when driving a car, hiking the rim of a mountain, riding a bicycle, or even cooking dinner over a hot stove. People are not stupid, they know this. If an explorer is hurt, it is his or her own fault for choosing to explore. I am of course very grateful to policemen and women for the important service that they provide. Their role in the community is irreplaceable and extremely important. It is simply my hope that they will not overreact if they catch a student engaged in honest exploration, devoid of any intent to steal or vandalize. This goes for the faculty at UVA as well. If a student sneeks into a building and steals something. By all means. Prosecute him to the fullest. Expell him even, for infringing the honor code he signed. But if a student sneaks onto a rooftop to take some pictures or to gaze at the stars, expulsion should have no place among the consequences that she faces. If ever expulsion occured for such a minor "misdemeanor," I must say that I would lose a large amount of respect for this university (and I hold this university in great respect). That being said, I'm sure the warnings of explusion were nothing more than a rational scare tactic to discourage students from wanting to steam tunnel in the future. I doubt they they would actually expell a student. At least I hope not. The blue windows are what caught my attention...never saw them before. I like how the close proximity of the left side of the photo helps accentuate the depth on the right side. 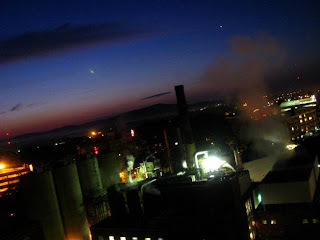 Went out on the water towers with a friend, took a couple pics, then left and alone I went to the hospital to catch the moon as it set over the horizon. Then I realized the sun was on its way up, so i stuck around to snap a few good ones as a last timer before leavin C-vill. I wanted to wait all the way until the sun actually peeked out, but employees were starting to fill the building and I could hear people clankin' around in the lower roof/floors. All the color is natural, I didn't change anything. Click on pictures to view larger file size. The distracting black object is my mp3 player...didnt realize that. So there was painting scaffolding up around the Rotunda--a major opportunity to summit its dome with ease. When I drove by it and saw the scaffolding, I knew I had to try that night while I had the opportunity before they took it down. However, I had not slept in three days because of a ridiculous week of finals and was going home to crash. I set my alarm for 3:00am, but I was so tired that I slept through it and slept all the way until the next day. I woke up slightly bummed for not going, then, when I passed by the Rotunda that day, I couldn't believe my eyes--they had taken down the scaffolding! So like a fool I missed my golden opportunity. I can only hope that they put the scaffolding back up after graduation to take down whatever camera's and junk they put up there. Otherwise I will have to wait until next year, or attempt another way up. I have thought of two other ways up but they are rather elaborate and I would only try them as a very last resort.